Did you know that portmanteau is a fancy word for blending the sounds and combining the meanings of two other words to create a new one? Brunch, for example, is the combination of breakfast and lunch and refers to the boozy weekend meals between 10 a.m. and 3 p.m. where it’s socially acceptable to eat both eggs and steak and be drunk, and it’s okay. To me, it’s like a small holiday every single weekend. Below are a few of my favorite brunch places. Arguably my favorite brunch in the entire city, George Artisan Bakery & Bistro boasts South meets South Cuisine. That is the South of France meets the South of Florida. Husband/Wife owner and chef duo pride themselves on Herbs de Provence, fresh bread, authentic coffee and the warm spirit of the American South. What’s on the menu: I get the Smoked Salmon Poached Eggs just about every single time I go. Artisan toast is topped with smooth cream cheese, cucumber, salty smoked salmon, and fresh herbs like capers, dill, and scallions all with a side of the herb potatoes. Inside Tip – add the truffle oil and parmesan, always add the truffle oil and parmesan here if you can. Also on the menu is a strong espresso and a pineapple orange mimosa. If you have a large group, they do a pitcher for $15. The fun thing here is that there are several juices on the menu to choose from! Other lovely items on the menu include the truffle mushroom omelet, lobster roll on brioche and heck everything else! FYI they do take reservations and I highly recommend it as they do get busy. Owned by fifth generation Pensacolians or “natives” hence the name, Native café is where the locals go on Pensacola Beach. Known for its homestyle type breakfast and welcoming atmosphere, this is a place you don’t want to miss when visiting. What’s on the menu: For brunch fans out there that aren’t the biggest fans of poaches eggs, try the Eggs Benedict Arnold. Two fluffy biscuits are topped with a breakfast meat of your choice, two fried eggs, and white sausage crazy. A southern spin on a classic with everything on it except the kitchen sink! If you’re not in the mood for something else, check out the Big Beach’n Omelets or the Pancake-wich. The cutest little pink cottage on the block, Dharma Blue boasts an inviting quaint atmosphere with indoor and outdoor patio seating in historic Seville Square. The word "dharma" derives from several different eastern beliefs and religions. Though there is not a direct translation of "dharma" from Sanskrit to English, it can roughly be defined in western terms as the essence and way of the universe. Blue refers to sky and water: the cycles which nurture and provide for the earth. What’s on the menu: For me it’s the Creole Benedict, a true southern meal on a plate. A classic English muffin is met by a perfectly seasoned fried green tomato (consistency and flavor it GOOD here), salty tasso which is a type of spicy cured pork, poached eggs and buttery hollandaise. Serve it with a side of cheese grits and a cucumber vodka Bloody Mary and you’ve got me whistling a different tune! If you can, also go for lunch or dinner. The sushi bar is exquisite, and the atmosphere is perfect for a date night. Don’t let the exterior full you, the food here is the bomb-dot-com! All of the egg benedicts here are served on a fluffy southern biscuit. If that doesn’t get your mouth watering I don’t know what will. What’s on the menu: Bring your appetite for the Angus Filet Benedict. A homemade fluffy biscuit is topped with creole poached eggs served under TWO certified Angus filets with wilted spinach. But wait there’s more, it’s smothered in crabmeat mornay sauce. Don’t worry, they have a forklift onsite to roll you to the door. The Fish House is a brunch spot that I frequent most of all. What I love about The Fish House is that the menu is large so there is something for everyone. 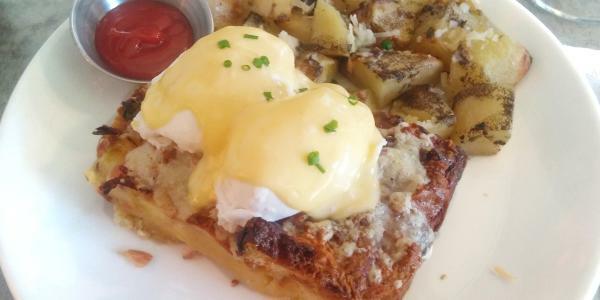 With an entire section dedicated to eggs benedict, you can find me snacking on the Benedict Acadia. A mixture of Applewood smoked bacon, crawfish, Tasso, peppers and onions, topped with a soft-poached egg and hollandaise. Other specialty brunch items include the cinnamon toast crunch French toast, Jack Daniel’s Chicken and Waffle, and the World-Famous Grits a Ya Ya. The best part of brunch here though is the $5 bottomless mimosas and $2 Bloody Mary’s. Have a brunch spot we may have missed? Tell us in the comments below! "It's not about my story, it's about yours"
Lindsey Steck is a marketing associate for Visit Pensacola. A Pensacola native, Steck enjoys hosting dinner parties, traveling as much as she can and NFL football. She moved away for a brief period following college and soon returned after realizing why people vacation and retire to the coast. On the weekends you'll find her scouring the closest market with a fresh bouquet of flowers in her arms and a macaron in hand.